The Swiss really love their animals. 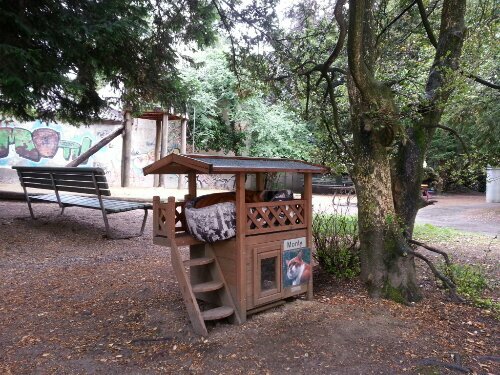 Walking past a small park in Zürich, I saw a small little shed/hut next to one of the trees. If the photo is any indication, this is Monty’s crib. It may not be obvious from the photo, but Monty is snoozing in the cat bed, underneath the shade. 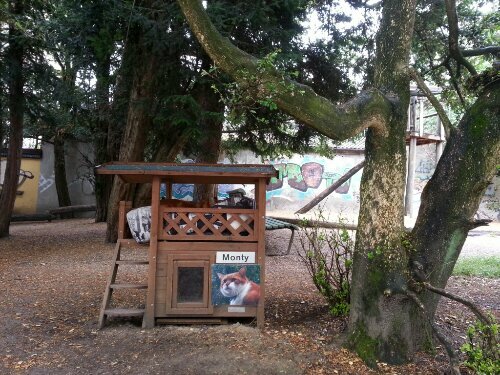 I didn’t see the pet owner anywhere in the area, but I assume that Monty lives somewhere in the neighbourhood and loves to hang out in the park. Monty must really love finding solace there – such that his owner saw it fit get him his own little gazebo to hang out in! Swiss pets are one lucky lot. If a society goes to great lengths to ensure the safety, comfort and general well-being of their pets and animals, it would be safe to assume that they would do the same – if not more – for their own people. Which would explain this particular finding. In the meantime, I have to hide these photos from Muci. Wouldn’t want him getting any ideas of a personalised gazebo then. This entry was posted in Blog and tagged happiest countries, pampered pets. Bookmark the permalink.